A complete re-survey of the city of Detroit, Houston and other target cities using Volunteer Citizen Scientists. Creating a canine survey template for an annual Dog count (similar to Audubon Society Bird Count) in 20 US cities. Publishing a peer-reviewed scientific paper providing an answer to the question of how many Dogs are stray or homeless across the United States and the prescribed methods for obtaining the data. Getting the question of "How Many Pets are in a Household?" on the 2030 US census. The MISSION & IMPACT of this unprecedented canine survey is to develop an accurate count of dog populations in large cities while developing a set of data collection tools built in a user-friendly template for use the world over. The resulting data will be made available to government and non-governmental organizations, using it to conduct more accurate & cost effective activities that address REAL problems/needs. The initial WA2S survey intends to reveal the dynamics surrounding the population of free-roaming canines within specific geographic boundaries. 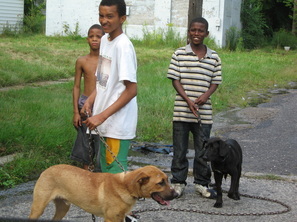 _ At the start of 2011 various media outlets and internet sources began reporting an excessive “stray dog problem” in the City of Detroit; Media reports throughout the year communicated that the “stray” canine population in the City of Detroit consists of “50,000-100,000 dogs loose in the City”. 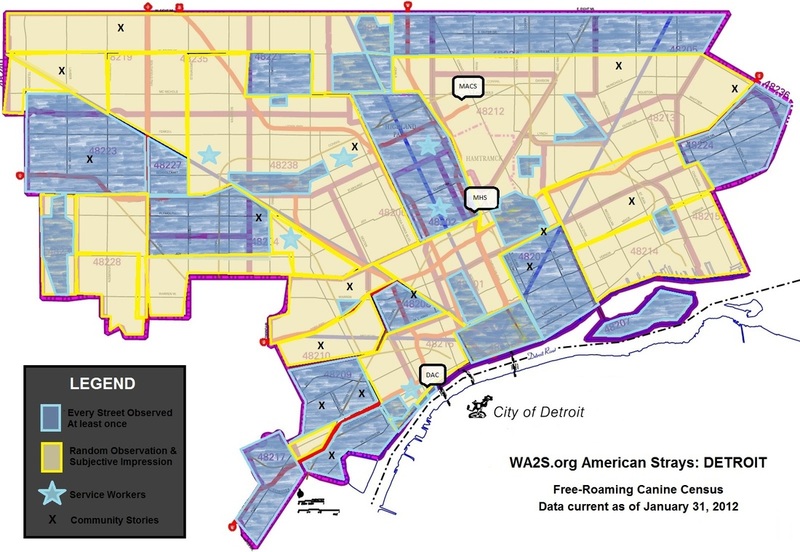 As of January 31, 2012, the WA2S.org team has visited communities & collected varying levels of data within every zip-code of the City of Detroit. 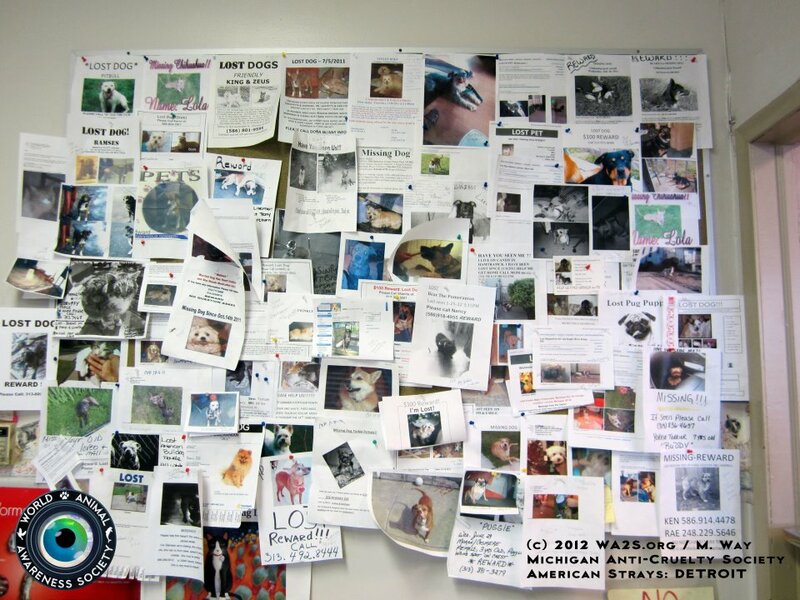 Although we have only collected a portion of the objective data, we can report with certainty that the aforementioned media accounting of Detroit's “stray” canine population is inaccurate. Free-roaming canines exist in the City of Detroit, but not in the quantity reported. Research methods have stabilized and a standard data set has been collected in every square mile visited since September 2011, including photo/video documentation of the free-roaming canine population. 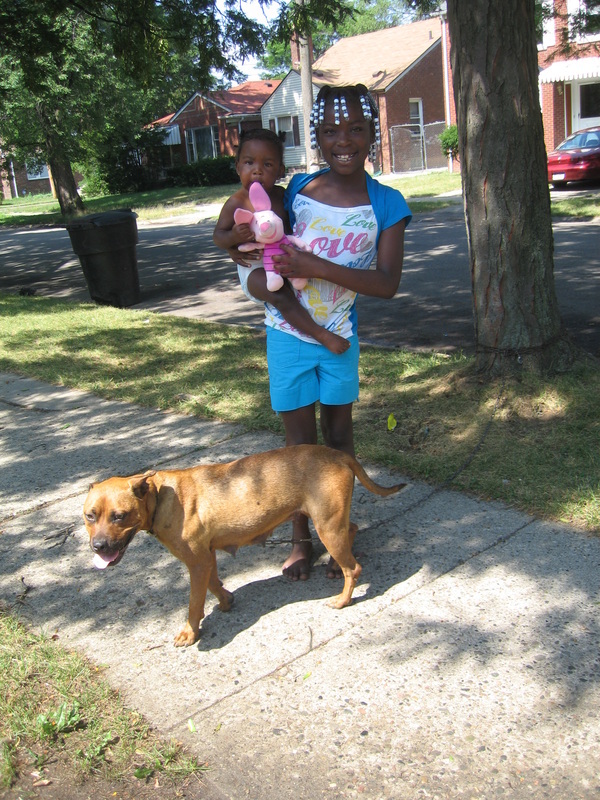 Through direct observation our team has obtained a subjective impression of the canine population through visiting communities within every zip-code of the City. The street-by-street survey is partially complete. The following map illustrates areas visited from February 2011 through February 2012. _ To date (May 2012) thirteen different citizen scientists representing seven non-governmental animal organizations have participated in the street survey portion of this research. We have developed relationships with the 3 licensed animal shelters located in Detroit: (1) Michigan Human Society, (2) Michigan Anti-Cruelty Society, and (3) Detroit Animal Control. 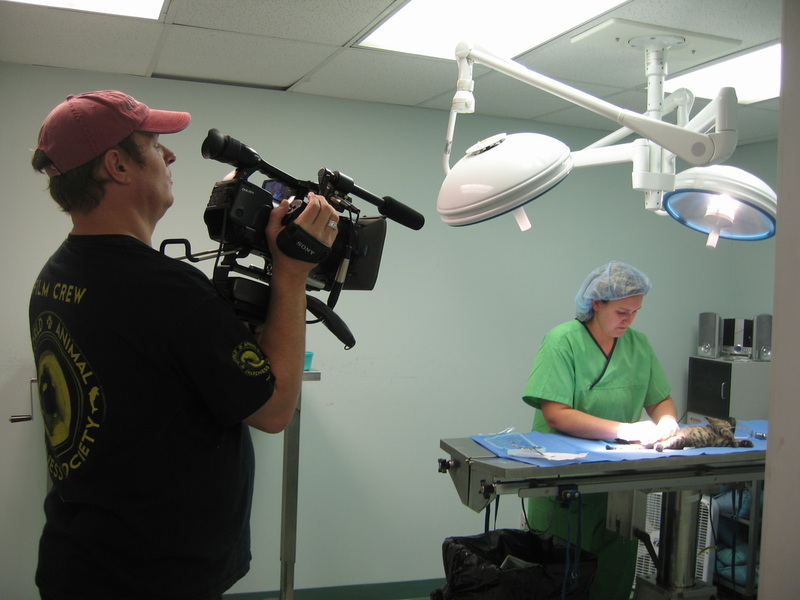 Our team has gained access to staff and data, as well as embeded with both Michigan Humane Society and Michigan Anti-Cruelty Society rescue staff. 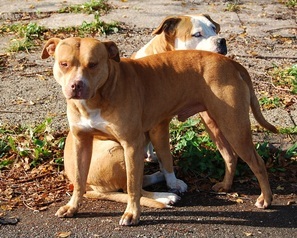 Our relationship with Detroit Animal Control is in process and we plan to embed & gather data with City AC officers soon. We maintain varying levels of relationship and have collected information from approximately 20 other non-governmental animal organizations. 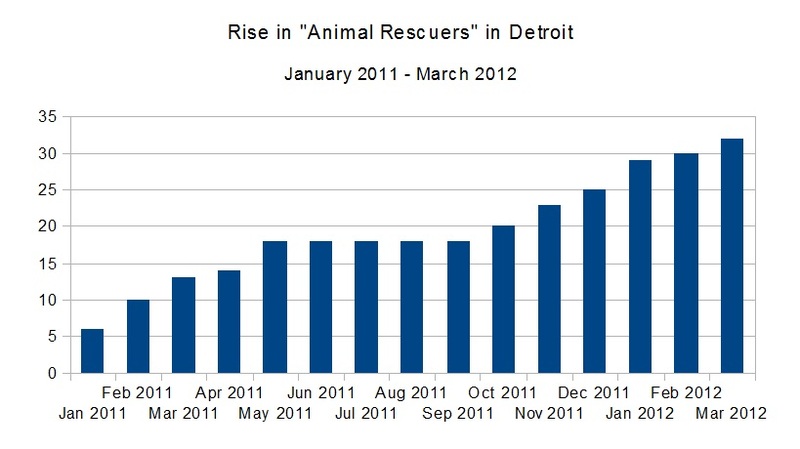 An explosion of new animal organizations/"rescuers" has occurred over the past year surrounding the free-roaming canine population within the City of Detroit. When new organizations sprout, WA2S.org researchers begin to create relationships to share knowledge. Abandoned homes, schools, and businesses exist in almost every community of Detroit. 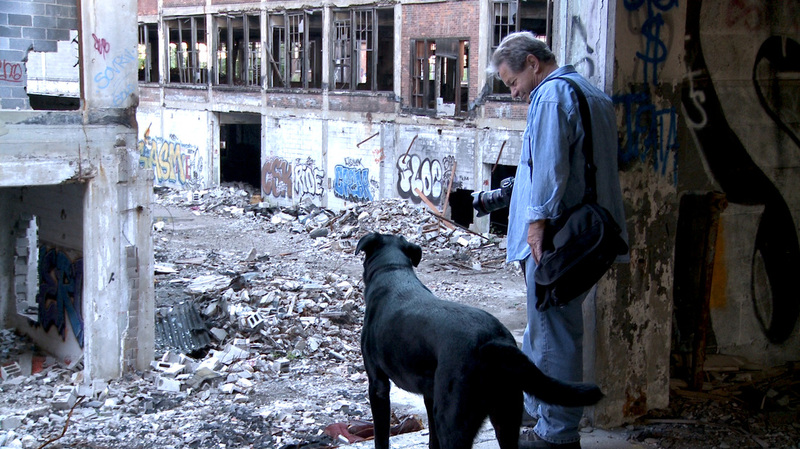 To address these spaces & the possible void or presence of animals within the abandon our team has explored various types of abandonment and created relationships with urban explorers who are providing information of 100's of abandon homes & buildings located throughout the City of Detroit. WA2S.org AMERICAN STRAYS PROJECT team members have met with the Department of Agriculture, as well as representatives of the Detroit Police Department and US Postal Service. Experts from the University of Michigan, Michigan State University, National Canine Research Council, and Animal Assistance Foundation have been consulted. 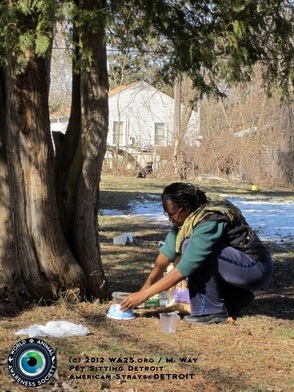 This research will span at least a 5-year period as we complete data collection in Detroit and begin to explore other cities throughout the USA. We expect to publish another written report with preliminary quantitative & qualitative results in early 2014. Many members of society perceive free-roaming canines as a nuisance, health & safety risk to humans, and a danger for the local canine population health & welfare. Research has shown that resolutions aimed to stabilize or decrease canine population density that consist of removal of the canine, without supplemental measures, have no significant impact on the population size (TRS 931 WHO Geneva 2005). Common solutions proposed by government and non-government organizations to control the animal population include various methods from licensing & other legislation to sterilization/vaccination programs. Developed & developing countries have been researching & establishing effective animal birth control (ABC) programs with free-roaming canines to stabilize or reduce the free-roaming canine populations. Before embarking on any canine population management program an initial objective data collection and assessment is necessary to understand the local dynamics of the canine population (ICAM Coalition, Humane Dog Population Management Guidance). This approach eliminates waste by ensuring that the final management program will be tailored to the characteristics of the local canine population, as opposed to using a blanket intervention for all possible situations which will likely cost more resources. The AMERICAN STRAYS PROJECT will provide results that government and/or non-government organizations may use to to effectively plan a city-wide population management program. What do you do when you see a free-roaming canine? What process is followed if you or someone else loses their pet? Where do you go to look for a lost pet? How often are lost pets returned to their family? 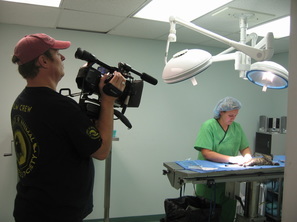 AMERICAN STRAYS 2030 PROJECT is a legacy program of the World Animal Awareness Society. 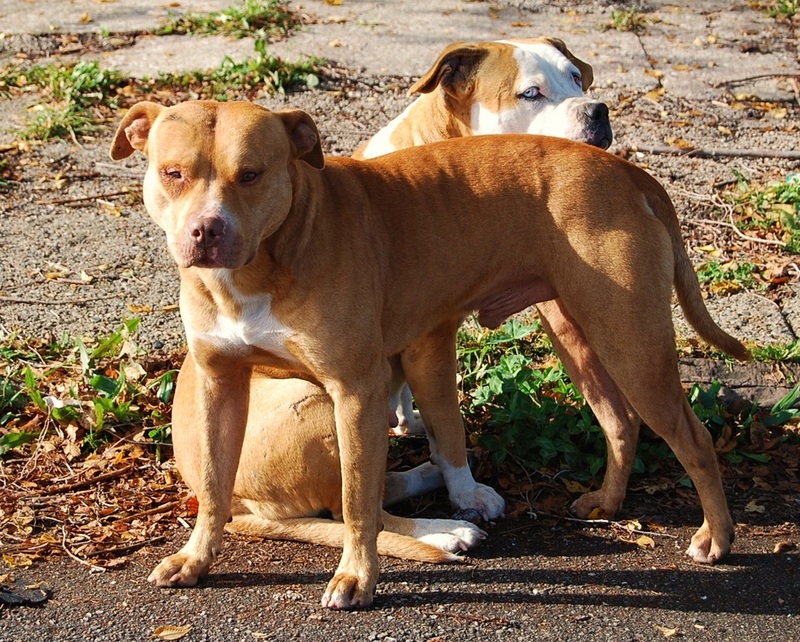 With help, homeless dogs in America can become a thing of the past. Become a Sustaining Partner!